Hawaii wasn’t originally on my immediate must-visit list, but when two of Ben and my best friends moved to Kauai last July, the opportunity to visit them in paradise was too incredible to miss. We stayed in their beautiful apartment, sipped mai tais on their lanai (which is a term I learned means “gigantic porch you can spend 85% of your life on because this is Hawaii”—I wonder why I never hear it mentioned in Wisconsin), and walked down to the beach every morning to watch the sunrise with their neighbors. Do you see why I’m determined to return? Although my favorite part of the trip was spending time with our gracious hosts Liz and John (and, ok, the beach), Kauai stole my heart in unexpected ways. Ben and I love the beach, but we usually opt to spend our warm-weather vacations eating guacamole, sipping margaritas, and remaining as immobile as possible in Cancun. Our trip to Kauai involved plenty of beach time to be certain, but the island is far more rugged and less resort-y than I had anticipated. Kauai’s beauty is striking in way that does not grow old. For 10 straight days, I lost my breath every time we drove over a new hill to reveal a fresh expanse of green pasture against craggy mountain peaks, or the sun burst from behind a cloud to illuminate the canyons below. I could look at the same water crashing into the same line of rocks for hours and feel just as awestruck when we left as I did when we arrived. I don’t know if you can ever “get used to” Kauai, only that I never even came close. 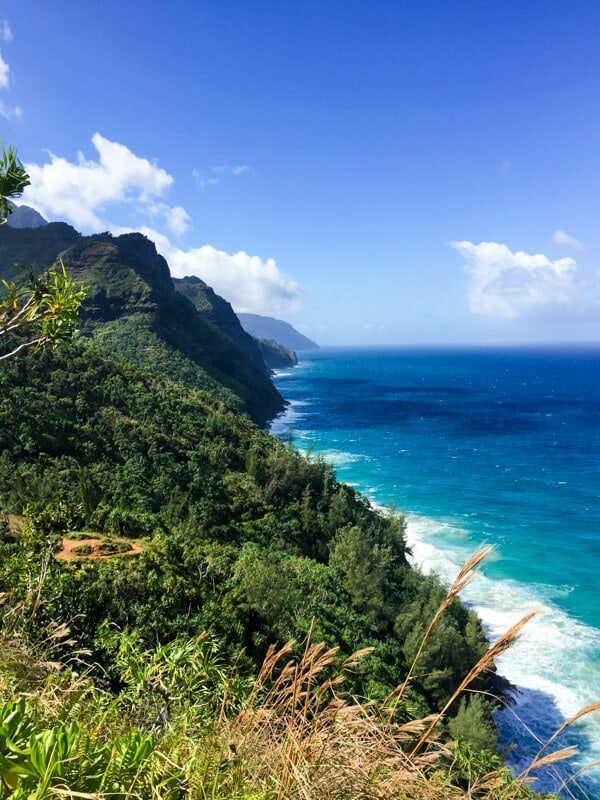 My travel bucket list is long, so I didn’t go into this trip thinking I’d be in a rush to return, not because I didn’t think Kauai would be magnificent (because it is), but because I thought I’d want to use my time and resources to try somewhere new. I was wrong about that too. 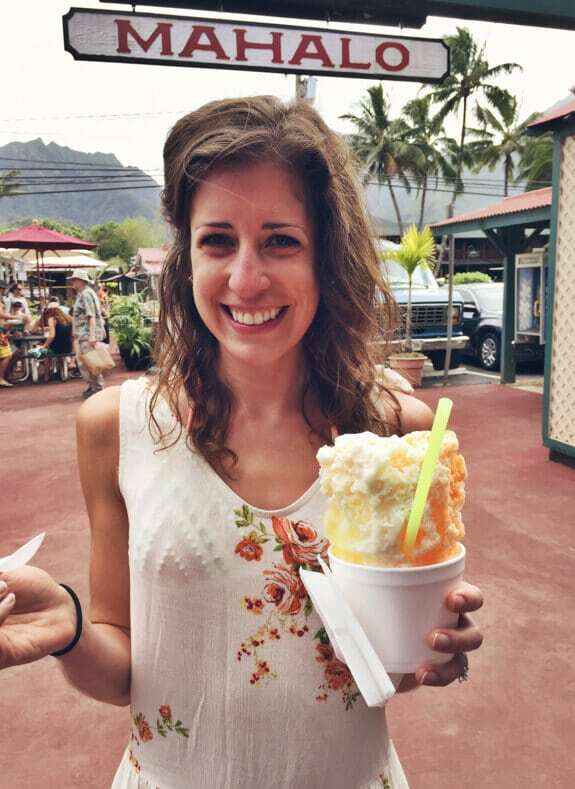 If you are looking for a special place to travel, I highly endorse Kauai, and I’d bet you my last sip of shaved ice that it will steal your heart too. 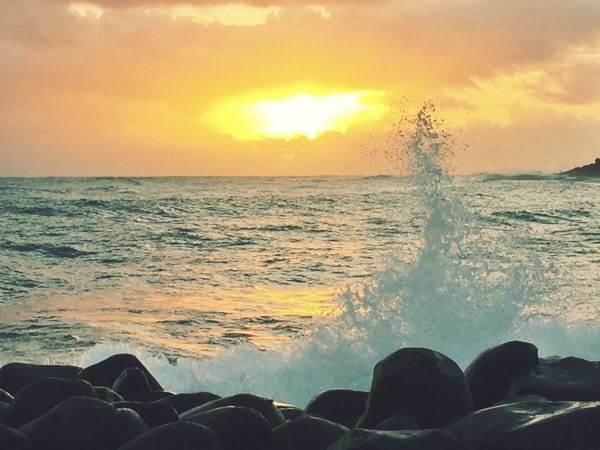 To help with your Kauai vacation planning—whether it’s a mental, wishful one or you have actual plane tickets booked—here’s a recap of some of our favorite activities. 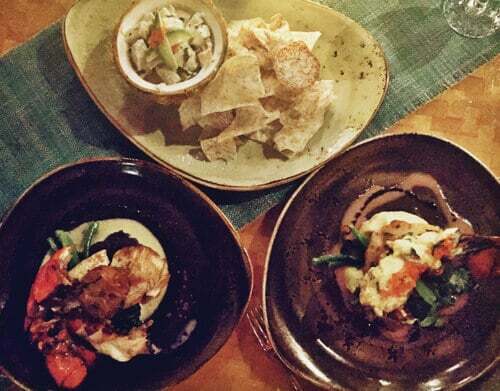 Note: eating might be our favorite activity of all, so get ready for a loooong list of island noshing! Hanalai Bay. It’s ideal for being a sun bum, surfing, and day drinking. Larsen’s Beach. Very private and lots of whale watching while we were there. Moloa’a. I shouldn’t even tell you about this beach. Don’t go. Keep it a secret! Polihale: 17 miles of uninterrupted sand. 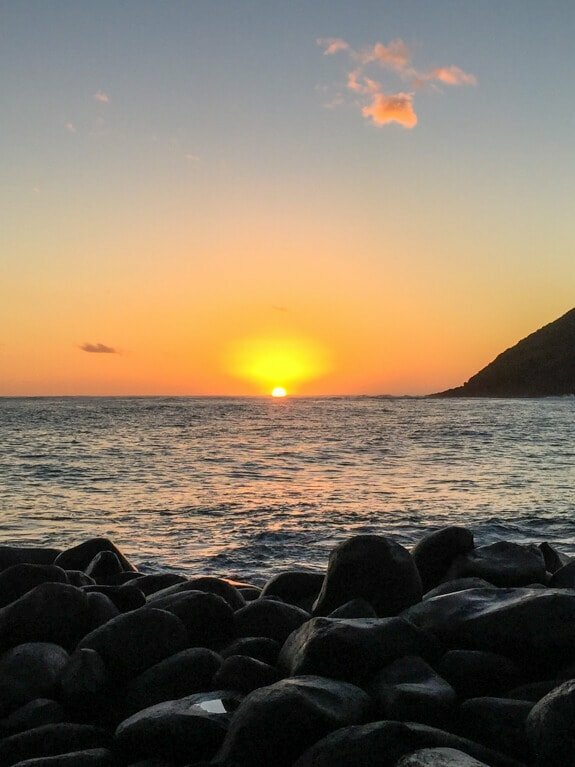 This beach is on the far western end of the island, making it an epic spot to watch the sunset. I felt like I was at the end of the earth. A traditional Hawaii luau—a ceremony and meal where a whole pig is cooked in the ground for hours (a preparation referred to as “Kalua”), then served along with a variety of traditional sides like sticky rice pudding, mmmmm—is one of the most touristy things you can do in Kauai, and I wouldn’t have missed it for a moment. Though there are several to choose from, I’m so happy that we went to Smith’s, which is operated by four generations of the same family. Though Smith’s serves hundreds of people on luau nights, the food was excellent (and the bottomless mai-tais appreciated). 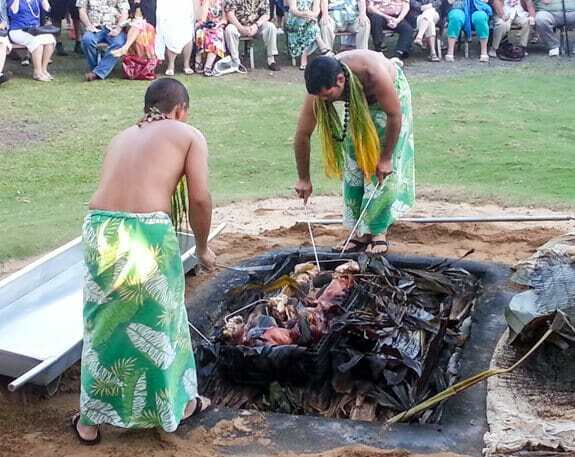 We were even able to watch the traditional ceremony of the pig being removed from the imu (underground oven). Following the feast, we were entertained by a luau show spectacular (I assured myself that the luau dancers have extra hip joints that I don’t because how do they move like that? ), and I also love exploring the gardens. Smith’s is housed on 30 lush acres, and luau attendees are free to arrive early and explore. By far the most epic adventure of the trip. The vast majority of Kauai it too rugged to be accessed by car, so Ben, Liz and I took to the air. Our trusty pilot Preston took us on a breathtaking air tour of Kauai. 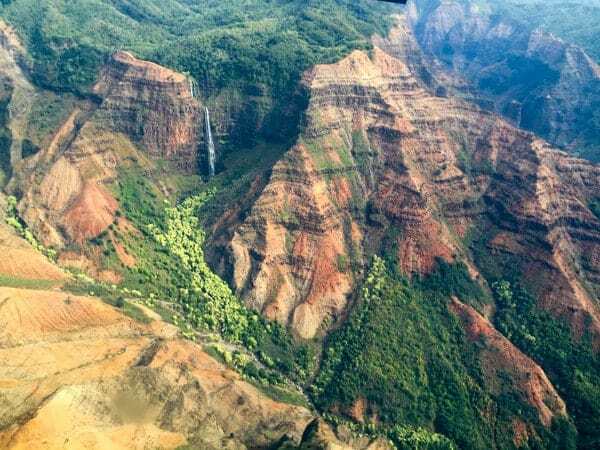 We saw the celebrated Jurassic Park falls (the movie was filmed on Kauai), flew through the expansive, awe-striking Waimai Canyon, and even checked in on Liz’s house. 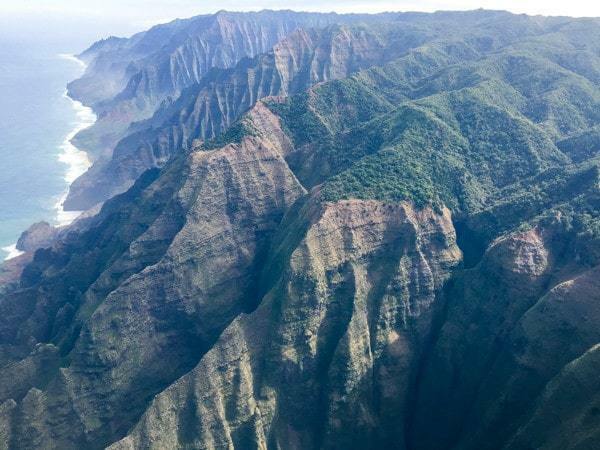 One of the biggest reasons to take a flight is to glimpse the elusive Na Pali Coast, a 13-mile stretch of the island that has absolutely no roads, because the cliffs are too jagged (even hiking is a challenge). 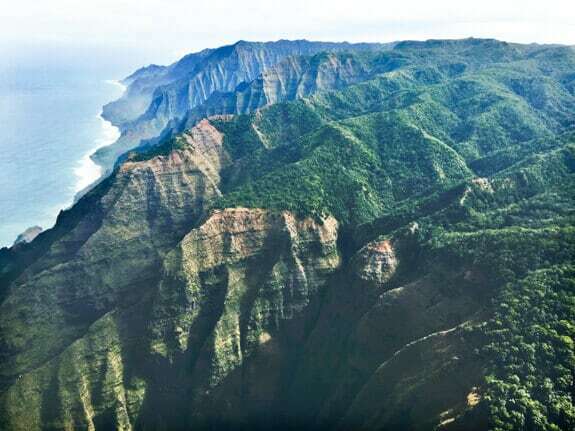 Though I hiked a bit of the Na Pali on the north end, then camped by its south end, nothing compared to seeing it from the sky. Hike two more miles and you’ll reach Hanakapi’ai Falls. Unfortunately I ran out of time and had to turn around, but those falls are on my list for when we return. On our last night in Kauai, we headed all the way west to Polihale at the south end of the Na Pali Coast to camp on its sandy dunes. 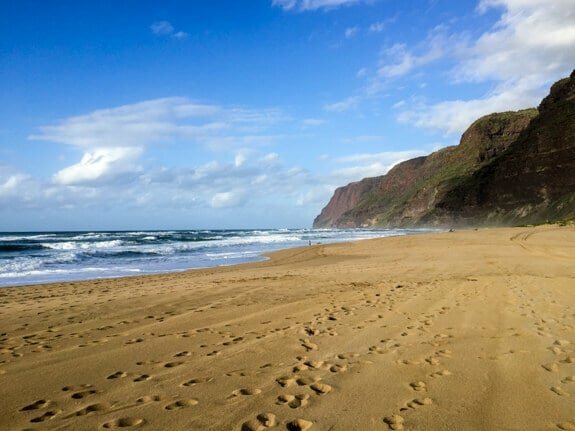 (Geography review: Polihale is only 13 miles from “where the road ends” on the north side of the Na Pali, but you have to drive all the way around the island to reach it). This part of the island felt completely unique to the rest of Kauai. It was drier and felt more isolated, but in a good way that made me feel as if there are parts of the world still left to be discovered. 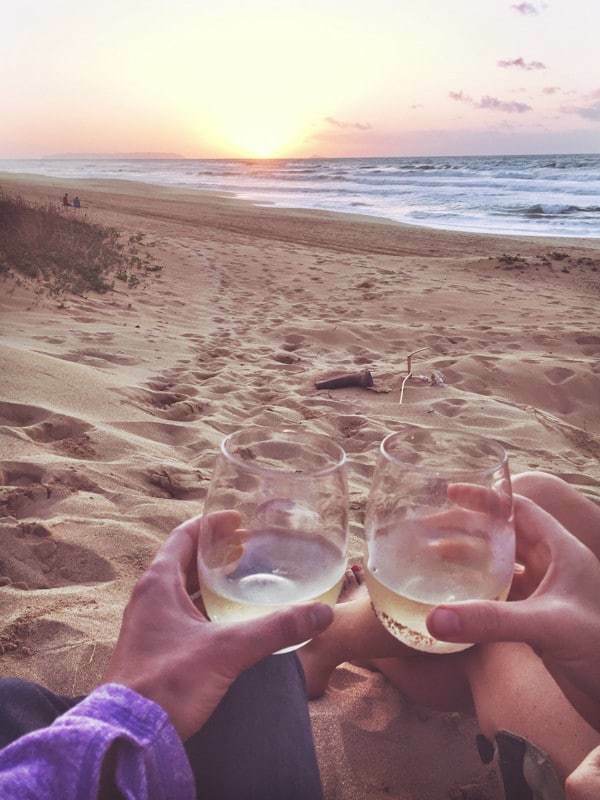 Go to Polihale to watch the sun set into the ocean. Bring wine. You and your camera, everywhere, all the time in Kauai. As I mentioned this place will continually take your breath away. Get clicky. Here it is—the grand Kauai restaurant review. Two seafood lovers trapped in a landlocked state, Ben and I made it a personal mission to eat it as much and as often as possible. We succeeded. If you are seeking fabulous food, stellar service, and a beautiful waterside setting so romantic I half hoped Ben would propose again, look no further than Tidepools at the Grand Hyatt Kauai Resort. Although we were not overnight guests at the Hyatt, I’m so glad we came in here for dinner and could have easily made a night of floating between the hotel’s different bars and restaurants. I started with a fresh pineapple julep at the Tidepools bar. 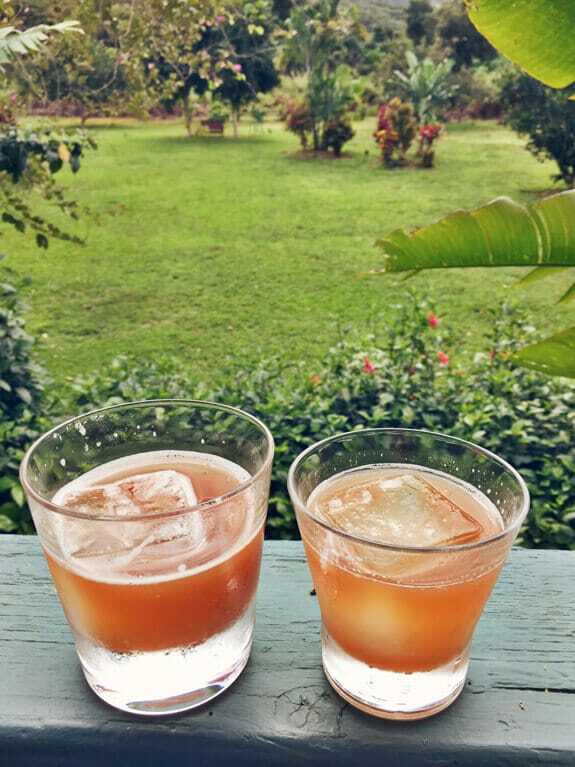 In case you are wondering, bourbon does tropical very, very well. Every element of our dinner was perfectly and thoughtfully prepared, both in flavor and in presentation. The ono ceviche appetizer was some of the best seafood we tasted, and my baby green salad was so artistically arranged, I almost felt bad devouring the entire plate. Almost. After some menu decision agony, we picked two different fish, both of which were fabulous. I didn’t need to stress—I honestly don’t think Tidepools serves a bad meal. Though neither of us ordered steak, I did thoroughly oogle my neighbor’s, and I’m confident meat would be an excellent choice too. My only regret of this evening: not ordering the coconut crème brulee in addition to the flourless chocolate cake. We’re coming back. 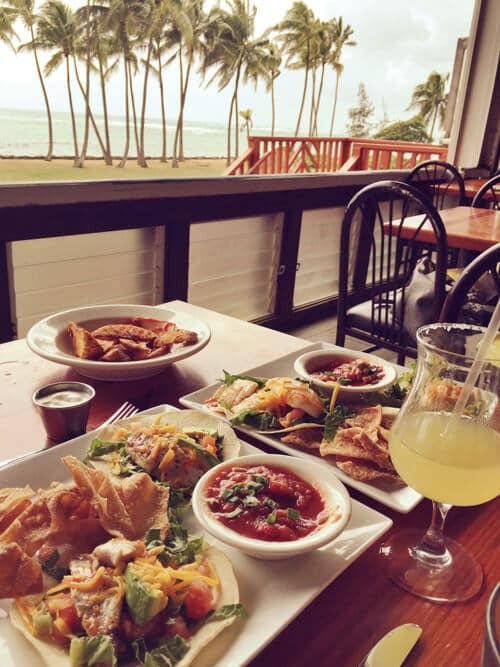 Located in bustling Kapa’a, charming Beachwalk Restaurant and Grill offers a laid-back atmosphere, open air ocean views, and $5 (almost) all day margaritas and mai-tais. Life fan, right here. We actually went twice—once for fish tacos at lunch, then again for dinner on our last night where we both ordered (prepare yourself): crab cake encrusted tilapia. Yes, it is a thing. I shed a small tear of joy. 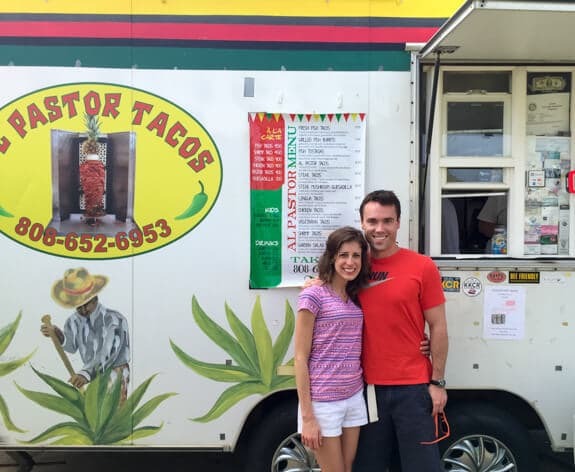 We ate the best tasting and best value fish tacos of the trip out of a truck. Visit Al Pastor on a sunny day (all of them in Kauai) for a plate of the catch of the day tacos grilled on order, served on a Styrofoam tray with rice and beans. Eat it on one of their colorful picnic tables, stare out at the great blue Pacific, and marvel that life can be so, so good. What? You thought we were done eating fish tacos? 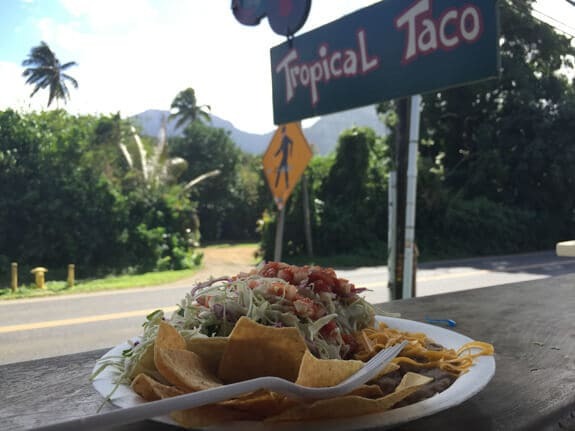 Tropical Taco makes a quick and convenient stop in Hanalei on your way to the northern beaches. Though these were our least favorite tacos of the trip—portions were a bit small for the price—they were undeniably fresh and fortified us for a hard afternoon of lying in the sun. If you’ve seen The Descendants, you’ve spotted this gem of a local bar and restaurant. 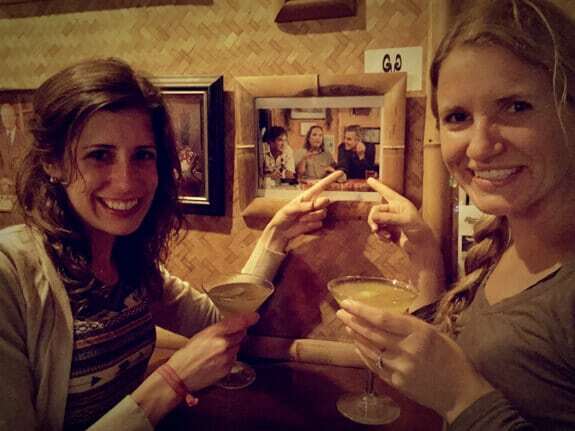 George Clooney hangs out at The Nui a few times, and if I lived on Kauai I would too. The atmosphere is relaxed and local, there’s live music, and they serve some of the best pizza I’ve had anywhere. 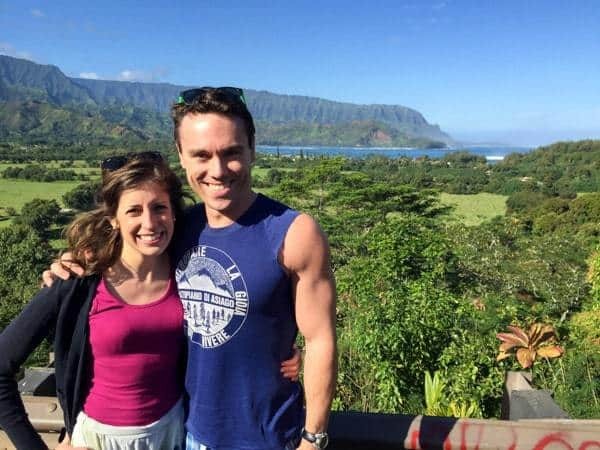 Fly to Kauai for pizza? Why not. Though there is nothing gourmet about it—it’s mostly burgers and sandwiches—the Hanalei Gourmet (located down the street from “The Nui”) is solid. Fair prices, local art on the walls, freshly caught fish the in fryer, and a decent beer selection. Really, what else do I need in my lunch? 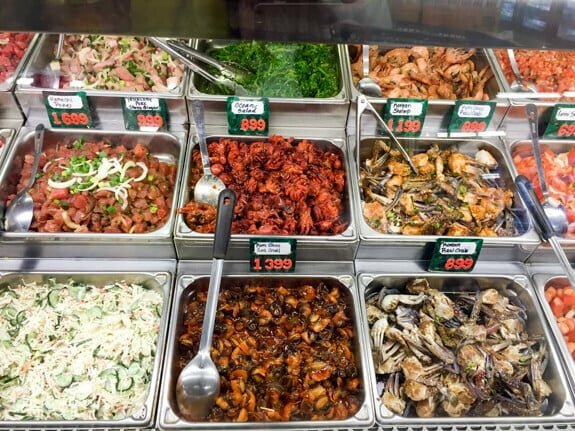 Ishihara Market is the ultimate proof that a dining establishment should not always be judged by appearances. 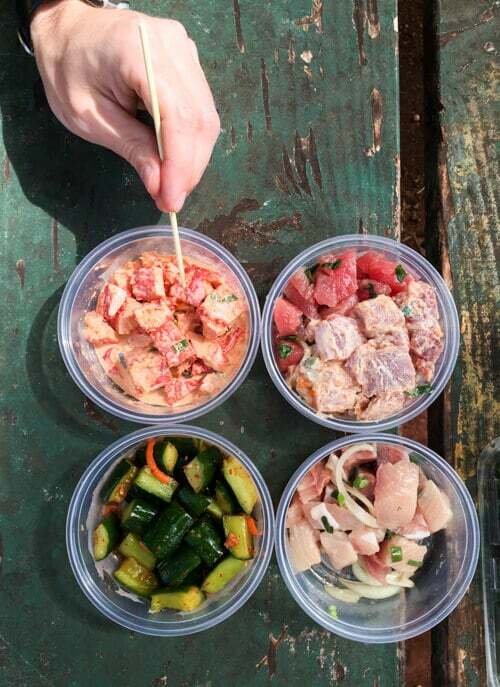 The deli in the back of this roadside grocery store serves up what is widely regarded as some of the best poke on the island. Think of poke as Hawaiian sushi, without the fuss of the rice and the roll. Incredibly fresh fish is served in carefully cut, raw pieces that are marinated in different varieties of citrus juices and spices. Poke might also include different sorts of veggies and other sea creatures too (baby octopus anyone? It’s actually pretty good. Chewy, but good). We loved this meal so much, we went twice, both times eating ourselves into a semi-coma on fresh fish for $20 total. Jo Jo’s, I love you. Until we meet again, my friend. 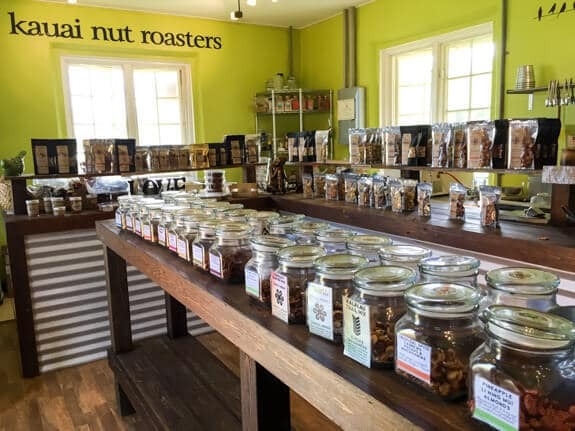 Follow the heavenly scent freshly roasted nuts into the Kauai Nut Roasters. I dare you to try to leave with fewer than three bags of their small batch, hand roasted, and fabulously flavored nuts (we made it out with four). Flavors range from Butterscotch Almonds to Coffee Coconut Macadamias to Maple Bacon Pecans. Samples abound, which turned out to be our detriment. We found far too many “favorites” to leave with just a bag or two. You didn’t think I’d leave Kauai without stopping into at least one bakery did you? 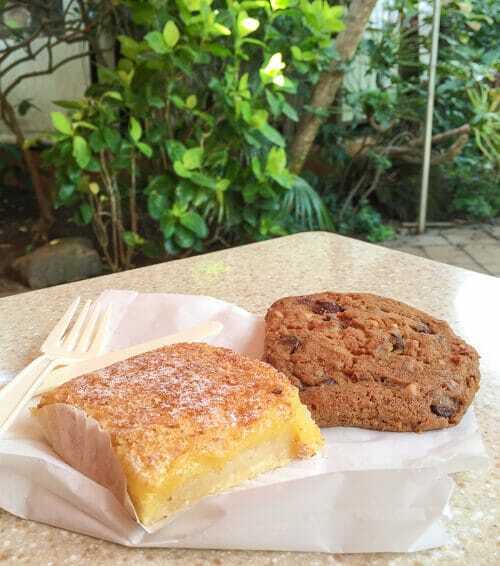 Kilauea Bakery is a bit of a hidden gem that Liz recommended and was mostly filled with locals. At the recommendation of the woman in line in front of me, I opted for the Passion Fruit Lemon Bar and half of Ben’s chocolate macadamia cookie (his fault for picking an in opportune moment to refill his water bottle!). It was a tasty 10 days. Next trip, we’re hitting Jo Jo’s four times, minimum. This world is a beautiful place, and I feel so fortunate to have been able to spend time with one of its brightest jewels, the garden island of Kauai. Even more, I’m grateful to have shared the experience with best friends. Dear Kauai, we will be back! This recap is based solely on my opinions and experiences during our trip. Thank you to Tidepools restaurant and Smith’s Family Luau for hosting our evenings with you. We hope to return! posted in Hawaii, Travel, U.S. So glad you fell in love with my island! There are hole in the wall places that you have missed. As being a former local resident, those are the places we hit vs. fine dining of the hotels. Hi there! I will be going to Kauai with friends in April. What places would you recommend? I’m so in love with Hawaii. It looks like you had the best time ever. If you figure out that salaried beach bum option, help a sista out! Erin, I ‘ve been waiting for this column since you said you were going to Kauai! Loved reading your enjoyment of the island and the photos which were breathtaking! It looks like you’re a travel writer too…consider adding travel magazines to your delightful career! Lovely pictures – thank you! It’s one way of getting there! It’s all in the details and you covered it! Exceptional writing, wonderful photos… totally beautiful post!! Hawaii is so on my bucket list! Lanai – I love that word, “Thank you for being a friend” – The Golden Girls. LOL. Such a beautiful and tasty trip, Erin! You are making me jealous that we didn’t go visit our friends that live on the main island this March. Now with a large hankering for fish tacos and a mai tai, I must start saving for next year! This is amazing! I am so insanely jealous of this amazing trip. Hawaii wasn’t on my short list but now I think may need to reconsider! Kauai and tasted the great dishes on the island. I just loved all that raw fish you showed and I get to eat it all the time, but I don’t. Come again! Love you recipes too!! 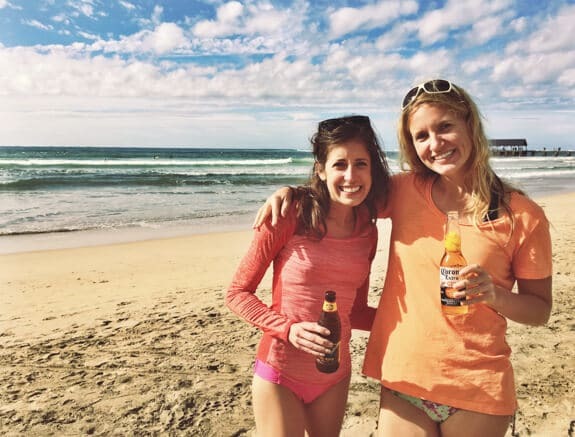 Loved this trip recap, Erin! I had similar feelings about Hawaii before our honeymoon. I thought it was maybe cheesy and over-comercialized, but we fell absolutely in love with the island of Kauai. It is a magical place. :) And those rainbows–every single day! Hey girl- looks like you had a great time!! God creates such beautiful things!! I love your pics!! I would love to go to Hawaii sometime!! 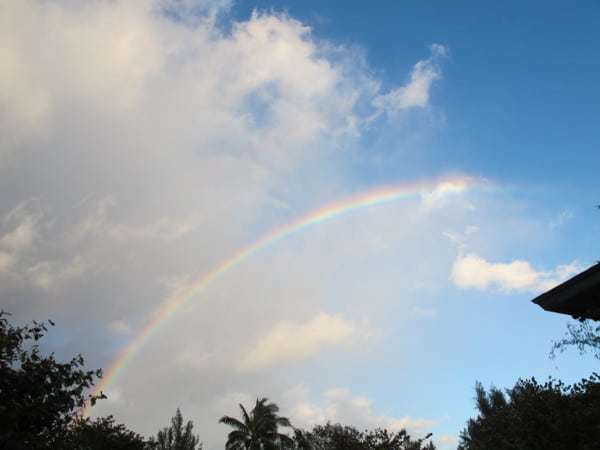 Living in Alaska, it was one of the closet places to go and after the first I feel in love with the beautiful island of Kauai, have been there numerous times, about 15. Invited 4 of my friends from the lower 48 to meet me there,they fell in love with Kauai also. We have also visited the islands of Maui and Oahu and will be on the Big Island in a couple of weeks and then we go to kauai for 12 more days. One definitely needs to add Hula Pie and Puka Dogs as foods to try on Kauai. As you can tell I am in love. It is truly special. Thanks Kristi! We went to Hawaii for our honeymoon and fell in love!! We’ve been already trying to decide how we can get back as soon as possible! Gorgeous photos! I have always wanted to go to Hawaii!!! It looks beautiful and amazing!!! I can totally understand why you want to go back so soon!!! :) Great recap! Why am I not in Kauai right now?! My husband and I got engaged in Maui almost 2 year ago, so I’ve been dying to back since then! Next time we go, I think I’d like to do a split trip between Maui and Kauai…gosh it’s so beautiful!! LOVE this! Although Kauai is definitely not sunny all of the days :( We went for our honeymoon in December (years ago) and they were in the middle of a random, gigantic storm so it was gloomy and raining HARD the entire trip. So sad! That’s what we get for going in December. These pics make me want to go back STAT! And your guide? The best! I’m sold. I need to start looking into flights! Kauai looks gorgeous!! Paula H, above, mentions the guy at the fruit stand,on the Princeville Road, who had just a Cuisinart and fresh pineapples. If I’m not mistaken that would have been “Banana Joe” and he made the absolute BEST EVER fresh fruit smoothies. And they were cheap, too. I spent the summer of ’85 living on what we called ‘Secret Beach’ the trailhead of which was close to Banana Joe’s. For a special treat, we’d put our clothes back on and hike the mile or so up from the beach and treat ourselves to one of his fabulous smoothies! OH the wonderful memories from ‘back in the day’! Baba, now I HAVE to go back to look for this smoothie stand! We went to secret beach too, though it was a fully clothed experience for all who were there that day. Such gorgeous scenery. It was one of my favorites too! For being such a small island I would have thought we would have had very similar trips…but I was wrong! We did the Na Pali coast by catamaran which was probably the highlight of our trip, but helicopter is a must for next time! And the macadamia nut ice cream!!! I’ve been craving shaved ice over that ice cream for years now. Can I be your backup tambourine player?? 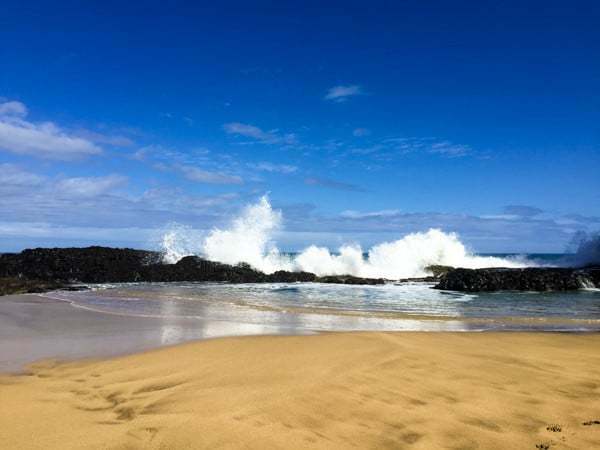 Your info about Kauai could not have come at a better time! My family already had a trip planned, so we went to many of your beach and restaurant recommendations. 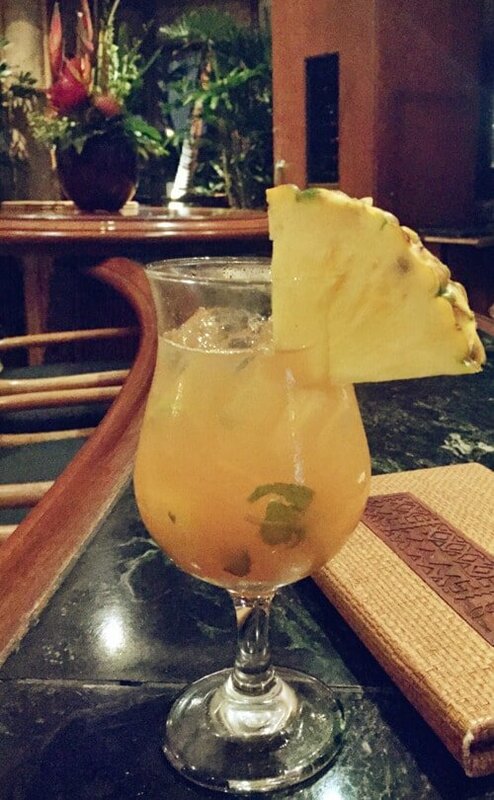 Our evening at Beachwalk was lovely and you are right about Tidepools–so romantic! Thanks so much for doing this post. .
Shelly, I am so, so excited to hear that this recap was helpful for you! And I’m also happy that you visited two of my favorite restaurants :-) Thanks so much for letting me know! Thank You so much for this pin! We just got back from our first trip there for our 30th anniversary. I had several pins to refer to and your was one of the most helpful! My only additional advice to people would be to rent a jeep over a convertible if you want to explore, like we did! Ha! Our favorite beaches were Polihale (which is where we got the car stuck in the sand) and Secret Beach. Both were well worth the effort to get there! We did several of your listings, even the JoJo’s, down to the exact flavor of shaved ice and ice cream. Awesome! I had no knowledge of the island at all so it was such a big help to get advice on the best things to do. When you have limited time there, you want to see and do as much as you can! I also talked with locals and got some of their ideas, too. What a Great Place! Awesome read and you definitely hit a lot of great spots. I own a new hiking tour co- we host shorter guided hikes for anyone who wants to gear themselves up for NaPali hiking. Feel free to ask questions! I’ve lived here 10 years. Oh and update- that Beachfront restaurant closed. But Sam’s- the new restaurant at that location- is great too! And Banana Joes is a must! Katie, I’m going to check out your company next time I’m in Kauai! And thanks for the update on Beachfront. I’m so sad to hear that, but glad Sam’s is great too. Aloha! Thank you so much for this!! I’m planning my first visit in May!!! This is getting me so excited! Cannot wait! And if you’re still looking for a way to earn money while vacationing/traveling. My company is hiring and can be worked from anywhere. Melissa, I’m so glad that this list is helpful to you. Have a wonderful trip. Kauai is truly a special place! Michelle, I am so excited for you too! I’m happy to hear this guide is helpful, and I hope that you love everywhere you try. Kauai is an amazing place. Soak up every minute! We spent a week on Kauai and didn’t eat at any of those places (but enjoyed our meals just as much)! I’m pinning this for when we return (which of course, we must). Have you been to or heard of Plantation Garden’s? I’ve been wondering if that would be a good place to go. Hi Arianne! I have not, but I’m sure you could look up other reviews online. Trip Advisor is a good resource. Erin thank you for such a great article! 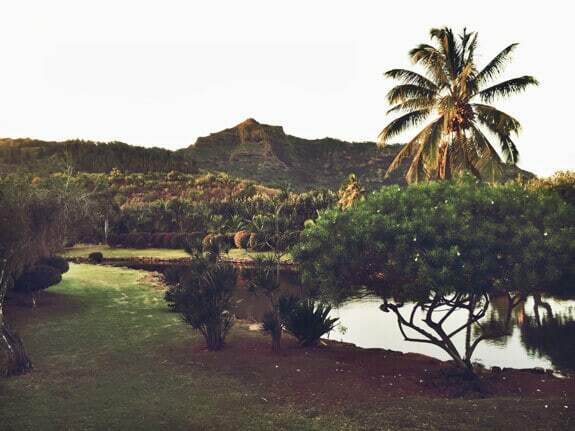 We are here in Kauai right now and like you’ve said, it is breathtaking around every corner! Do you mind me asking what your friends do for a living to be able to afford to live here? My husband and I have fallen completely in love but it doesn’t seem like the job market is very strong. Just curious what your friends do to be able to enjoy paradise as their everyday home. Hi Tara! One works for a school and the other is a freelancer. Both work very hard, live within their means, and they actually rent vs. own. We met MANY people who were happy to live with the basics and take any job they could, just to live in this piece of paradise. I have to say, after a few days there, I wanted to join them! Love it!!! We went to the tropical tacos today for lunch after a hike up the Kalalua Trail… amazing.. This is so great! My husband and I are going next month and I am so excited. Thanks for the tips. I hope you have an amazing trip, Ara! Erin, I too am from Milwaukee and my husband and I are headed to Kauai in November! Thank you for sharing your experiences! They will come in handy! Have an AMAZING time Katelyn. Kauai will truly steal your heart. I’m excited for you! Being in kauai and experiencing magic of lush green wonderland might be unforgettable moment for nay one. All the food images are looks amazing. Literally, just got to Kauai a wrote down all the places you recommended. Thank you for posting. Mahalo! Loved reading your post and looking at your pictures. We were in Kauai in 2015 for our 60th birthdays and absolutely loved it.. Then in 2016 we went to Maui to celebrate our 40th anniversary. 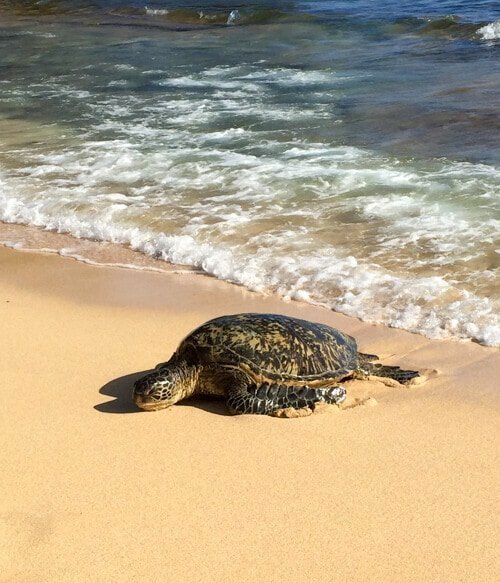 We loved Maui, but Kauai is so much more laid back, it is just amazing everywhere you look. Going back to Kauai in the fall, can’t wait. Plan on checking out some of your suggestions for restaurants. It is SUCH a special place Kathy! I hope you have a wonderful time! We enjoyed reading about your trip. Ditto on ALL the positive comments. Felt like I was there with you through your writing and images. Thanks for all the good tips too. We plan to go last part of August 2018. Ya! Stacey, thank you so much for this kind comment. Have an AMAZING time!! 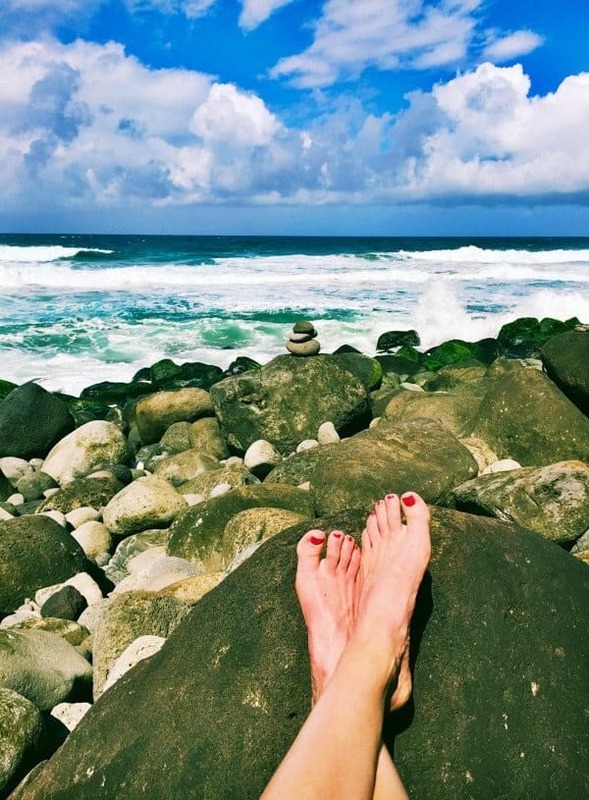 ahhhhh I feel exactly the same way about Kauai – it wasn’t on tiptop of my bucket list but when the opportunity came we went & now are seriously considering how we can move there in the next few years! It is incredible! Jojo’s sounds so good, I’ll have to try it next time. My favorite shave ice was Locococo – they also have macnut ice cream, which is daBOMB. Thanks for the tip, Erin! Glad to hear you thought it was magical too! 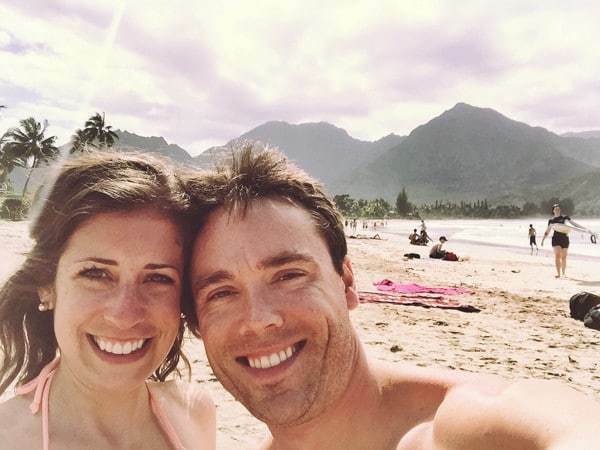 We just returned from Kauai last week and I am already trying to figure out how to go back! My husband and I went to Maui in 2016 for our 25th anniversary and loved it. The only thing missing was our kids. So, we took our whole family with us to Kauai for Christmas 2018 and it was an amazing experience. We spent Christmas Eve on a Napali Coast Sunset dinner cruise with Holo Holo charters and it was spectacular! We saw whales, dolphins and turtles and were able to go inside some sea caves. We loved shave ice at Hee Fat General Store in Kapa’a and returned there 3 times. My kids loved ziplining at Princeville Ranch. In Hanelei, we ate barbecue at Chicken in a Barrel and had shave ice at JoJo’s. We also went to the Smith Family luau and their food was incredible and their grounds, well, it’s just hard to believe there are such beautiful places in this world. 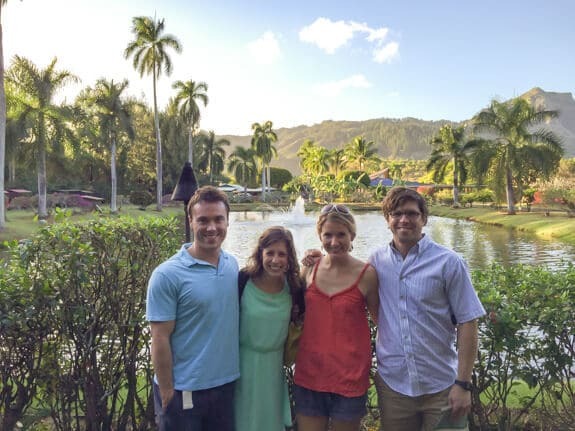 Before the luau, we went on the Smith Family’s river cruise to the beautiful fern grotto and loved it. My only disappointment was that it was a rainy week so snorkeling wasn’t good due to muddy waters. I have been to Oahu, Maui and Kauai and Kauai was my favorite island hands down and I will be back!! Heather, I’m so glad to hear you had a FANTASTIC time! Thanks for sharing this summary of your stay—you will definitely need to go back again! !